It’s the end of the summer holidays but don’t despair – it’s time for the DCCS Comics Clubs to start again! From Tuesday 15th August we will be running on Tuesdays from 4.30-6.30 pm for 10-13 year olds and on Wednesdays from 4.30-6.30 pm for 14-17 year olds. 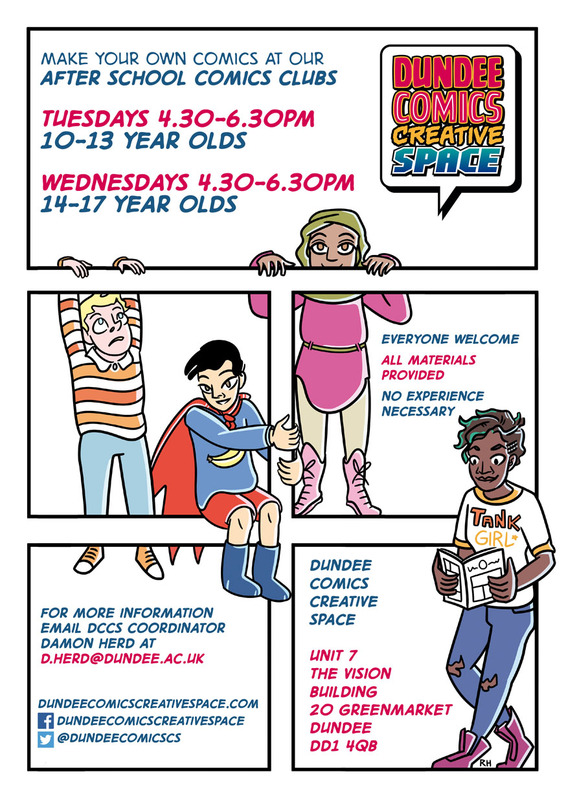 Check out our new flyer, with updated versions of our Comics Club characters by Ink Pot artist Rebecca Horner. Download a high res pdf version here. Posted on August 11, 2017 September 1, 2017 by dundeecomicscsPosted in Comics Club, dundeeTagged after-school, comics, Comics Club, drawing, dundee, rebecca horner, write. Here’s what DCCS artist Rebecca Horner is reading when she isn’t drawing comics. Posted on November 23, 2016 November 23, 2016 by dundeecomicscsPosted in Book Week, comicsTagged book week scotland, by crom, comics, rachel kahn, rebecca horner. Here is the final instalment of our collaborative web comic, produced by the incredibly talented Rebecca Horner! Well, that’s my two week internship here at DCCS over! The time has flown by and it’s been an amazing experience. Over the past two weeks I’ve been introduced to the world of comics and in particular the busy world of Dundee Comics Creative Space. Thank you to everyone who has allowed me the chance to interview you, and especially thanks to the DCCS team and artists for never saying no to a photo shoot! I’ve worked with Rebecca Horner, an amazing artist, to produce this collaborative web comic detailing my time here – thanks Rebecca for never complaining about my lack of artistic input! I’ve also had the chance to sit in on some of the workshops that go on here at the Space – both the after school Comics Clubs with young people, and the workshops that are happening in partnership with a group from Advocating Together; the finished product of this project will be a comic about tackling disability hate crime, and I can’t wait to see it! No two workshops are ever the same and I’ve had the chance to see just how incredibly creative the Comics Clubbers are, and to enjoy some classic cheese jokes (what’s the best cheese to hide a small horse with? Mascarpone!). I’ve learnt some valuable life lessons from Damon – mainly to always always keep note of your passwords, and that a Snickers a day is a necessity – but I’ve also learnt about graphic design, and our finished products were the DCCS posters and leaflets that are now distributed throughout the libraries and community centres of Dundee! Keep an eye out for them folks! Anyway, I’ve really enjoyed my time here so thank you for having me – but you’re not escaping me and my incessant posting that easily! I’ll be back in the Space regularly to keep up to date with what’s happening and hopefully to keep broadcasting information about DCCS over social media. But for now, Caitlin Mitchell, signing out! Posted on August 19, 2016 February 2, 2017 by dundeecomicscsPosted in web comicsTagged caitlin mitchell, comics, comics clubs, dccs, dundee, intern, rebecca horner, web comic, workshops. The third artist to be interviewed by Caitlin Mitchell in our profiling project is Rebecca Horner! I’m Rebecca Horner, I’m 23 and I was born in Belgium, raised in Fife but I now live in Dundee. What made you want to become an artist? I’ve just always wanted to be one, I always liked drawing pictures and my family thought I would grow out of it but I didn’t! Also I was home schooled from the age of 11 so I had more time to do creative stuff like drawing and photography. Do you have a preferred style of art? Pretty much all of my work is digital, and is very cartoony. I started using a tablet when I was about 12, so it feels like second nature to me. But I also keep sketch books and doodle and do life drawings and stuff like that. I like reading comics – if I’m not drawing them I’m reading them! I also like playing video games and playing with my cat Luna. I’ve only had her for a month and she’s a lot of fun. What is your favourite comic of all time? One of my favourites is DC: The New Frontier by Darwyn Cooke. Two of my other favourites are Fables and Bartkira – hundreds of artists have taken Akira and reinterpreted pages with Simpsons characters, and it’s so cool! What is the best thing about working in DCCS? Having a dedicated place to work is the best thing ever! The workshops are really fun as well. I’m always juggling about 4 or 5 different projects – today I’m working on a comic called Jackie the Monkey, which a writer commissioned me to do the art for. Posted on August 11, 2016 August 12, 2016 by dundeecomicscsPosted in artists, interviewsTagged artist profiles, comics, dundee, interviews, rebecca horner.